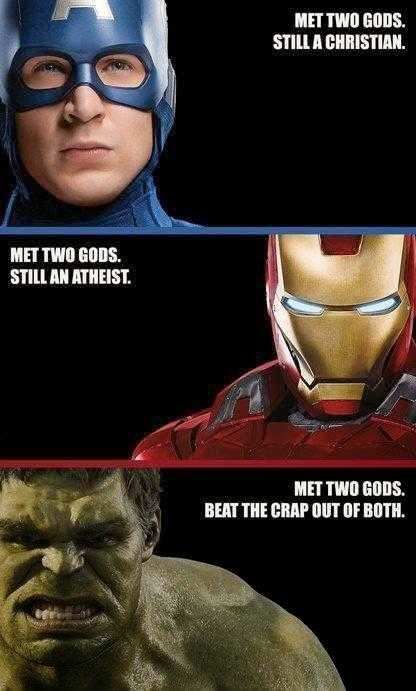 Avengers meme that confuses God and god. There is a difference. Jay Clair has been a very active member on my Contradict – They Can’t All Be True Facebook page. I discovered that he had a blog called Blue Eyed Shy Guy. The blog stood out to me because I am a fan of Mario 2 for the NES, and to my knowledge it was the only Mario game that featured the Shy Guy characters. Jay explains the name of his blog at the start of the podcast. For this show we discuss one of his blog posts that really stood out to me: “What is Meant by God?”. The blog post originated as a reply to an Avengers meme that his brother sent him. Many people compare belief in Jesus to belief in Zeus, basically saying, they’re both mythological gods. Yet, Jay responds with a break down of the difference between God with a capital G and god with a lower case g. Doing such shows that belief in Jesus is nowhere near the same as belief in Zeus. His work also shows that there isn’t as many proposed Gods to consider if someone is evaluating the world’s religions for truth. Click here to listen to Episode 4: Jesus vs. Zeus (Right click to download). Please consider subscribing to Reconnect on iTunes to help push the show into the New and Noteworthy category during it’s first two months of publication. This should generate many more listeners if Reconnect can make that category. Reviews, subscribers, and downloads on iTunes will make that happen. Click here for Joyous Wolf, the band that has provided the intro and outro music for Reconnect.